Less than two hours after two blasts blew through Brussels Airport, more explosions reportedly took place in metro stations throughout the Belgian capital. National Belga news agency reports Maelbeek and Schuman metro stations suffered explosions and people were injured. Update: A series of coordinated blasts in Belgium, two at the city's key airport and another at a busy subway station, are thought to be terrorist attacks. At least 25 people are believed to have been killed. Brussels is on lockdown — all metro stations have been shut down as the country is placed on its maximum terrorism level, and the city's transit shutdown was quickly expanded to include buses and trams. All Eurostar trains going into and out of Brussels were suspended. All Tuesday flights out of Brussels Airport were also canceled, and planes and passengers were being diverted from the area. Around 8 a.m. local time (3 a.m. 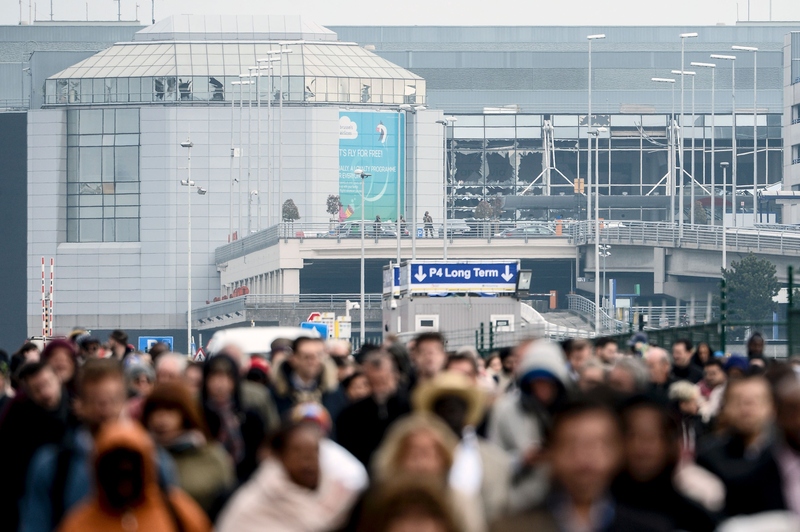 ET), two explosions occurred inside a departure hall at Brussels Airport. Local media reports at least 10 people were killed and dozens more injured, though casualty numbers could rise. Authorities have yet to release an official statement on either incidents. It was not immediately clear whether the explosions were related or were the result of terrorism. However, Brussels has been on high alert for terrorist activities since last November's Paris attacks, which culminated in the arrest of suspected terrorist Salah Abdeslam last week. Belgian authorities are advising people to stay where they are while the U.S. embassy in Brussels has told citizens to seek shelter. The emergency phone line is (+32) 02 506 47 11.